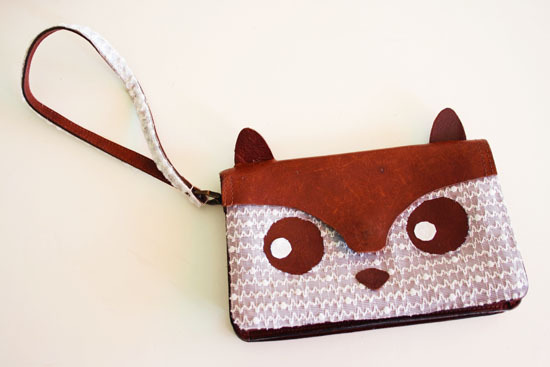 I have been dreaming to have this bag from Sorelle Online but find it too expensive in its P650 price (almost $16) so I refuse to buy it even though I am so obsessed into its cute animal face design. A few weeks after, I stumbled upon a blog where I saw the exact design and to my surprise, it is a DIY project! I feel so numb not to imagine that that cute design can be done by yourself! That is when I admit to myself that my creative side have not yet gone that far! I am really awestruck by this and I will definitely do one for myself instead of buying it! Lay down your shoulder bag and remove the belt. Removed the hardware on one side. Because this is going to be a purse you only need one side. Make a pattern for the face of your cute animal. You can do this by folding a piece of paper with the same width as your bag (or a little smaller like mine) and cut out the shape of one side of the head. Trace this with a pencil on your bag. Cut out. Cut out a piece of lace curtain that is more than big enough for the piece of your purse directly below the piece you just cut out. Use the seam of the lace curtain at the top. Use something round as a guide to trace around to create the eyes. Cut the eyes out. You may also cut out a piece for the button if you have one. Use fabric glue and put it on the bag where the lace curtain is coming. Only glue on the sides and around the button. Put glue on the lace around the eyes. Place the lace on your bag and let the glue dry. You don’t need more glue than this, this will keep everything in place. When the glue is dry you can cut the excess of the lace curtain. You also need to cut out two small circles out of the white fabric to finish the eyes. Glue those down as well. Take the pieces of leather that you cut out of the bag. Draw a ear on one of them and cut it out. Now use that ear as a guide to cut the other one. Make two cuts in the size of the ears at the top of your bag. Put the ears trough the holes from the inside out leaving about 1/3 of an inch inside the bag. Glue this down. You also need to cut a little nose out of the scraps and glue that down. Now you need to make the strap. You can use the old strap for this and cut it off at the desired length. I used the seem of my lace curtain to glue on one side of the strap to make it match my purse. You can now sew around the hardware of the bag and through the holes of the strap to keep the strap in place. Aren't it the cutest purse? It will surely give a statement to a simple, everyday outfits! All photos are from bywilma.com. Credits goes to the creative owner. WOw, I wouldn't have thought to do that myself either. What a clever idea. Great post. Great idea, honey ^^ Mina. ::gasps:: That is toooooo cute! Aww, so cute! I'll have to try this one day when I'm not feeling so lazy!! nice DIY tutorial, thank you for sharing this! I am Following you,,, but guess you didn't got time to follow back so m just reminding you again to follow back to keep in touch through comments! omg... this is so cute! your blog is amazing! would you like to follow each other? This is seriously one of the cutest diy's I have ever seen. But I love the before bag just as much.